Yes we made it home, to Terlingua. 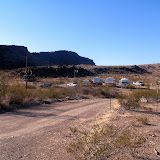 There is a piece of property on Terlingua Ranch that we have been looking at for about 3 years, with an RV park on it. We talked about buying it as a group, giving it some serious thought last year. Well this year it happened, Cat and Madam (Clayton and Trula Davis) bought it. Now our group has our own private campground, just for us, not open to the public. The group moved to Cats’ Flat’s while we were in Arizona. Now it was time for us to move and settle in. It’s amazing how we spread out when in one place for a period of time and how long it takes to pack up. It’s not just picking up the rug and chairs. It’s all the other crap, (Crap is my new favorite word) including the yard art. (June is editing this and says, “this is part of RV living…deal with it”, and we do. Anyway we made it out and have settled in. At one time this campground was used as a staging area for tours into Mexico. It is very small and is just right for our group. The full hook-up sites had 30AMP service; which, have since been upgraded to 50AMP service by a local electrician. Terlingua has a community garden where there is little rain, lots of critters (deer, javelina, coyotes, rabbits), bordered with fencing and summer temps reaching in the 120’s. Shannon is the local mind and energy behind this project. No chemicals please; you can come in and plant veggies of your choice, watering is shared by all. Compost and fresh brewed herbal tea are some of the local efforts. This tea is not for people, it’s fertilizer made from goat droppings. Amazingly there is no smell; Patti is sure. to have local theater. The two-weekend run of The Ballad of the Sad Café saw 350 in the audience, 13 actors on the stage, and 37 locals "behind the scenes." That's about a third of our winter population! To all, a huge thanks from Last Minute Low Budget Productions. Yes, to the theater we went, all five ladies and two wonderfully/brave men. Dressed in our clean everyday clothes we fit right in with most theater patrons. Shannon (our gardener and friend) was wearing a bare shoulder black formal gown, bolero and long black gloves. The play was professionally performed and enjoyed by all. As we headed toward Sun City West Arizona to see June’s life long friends Guy and Georgia we thought we should all meet for lunch. We met at the appointed restaurant and that was when it happened, the single bypass and flat liners. The doctor and nurses were present and took care of my every need, including putting on my wristband, (which indicated my single bypass) bringing me a beer, to go with the single bypass and flat liners. Check out their picture page. After our wonderful lunch we made our way to Guy and Georgia’s for the start of a wonderful time and some great margaritas. Getting back to Marie and Vic’s on Saturday we rested up for a Super Bowl party at Mike and Helene’s (Marie and Vic’s friends). 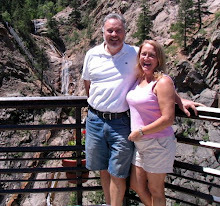 June and I started traveling 6 years ago during the winters. The first question was, can we stand each other 24/7? That question was answered after the first year when we bought a new trailer. Now we have sold our house and have been full timing for 2 years.